In this brand new American reboot of the monster movie Godzilla, it jumps right into featuring and revealing other monsters before the whole of the titular “King” of it all even made full appearance. 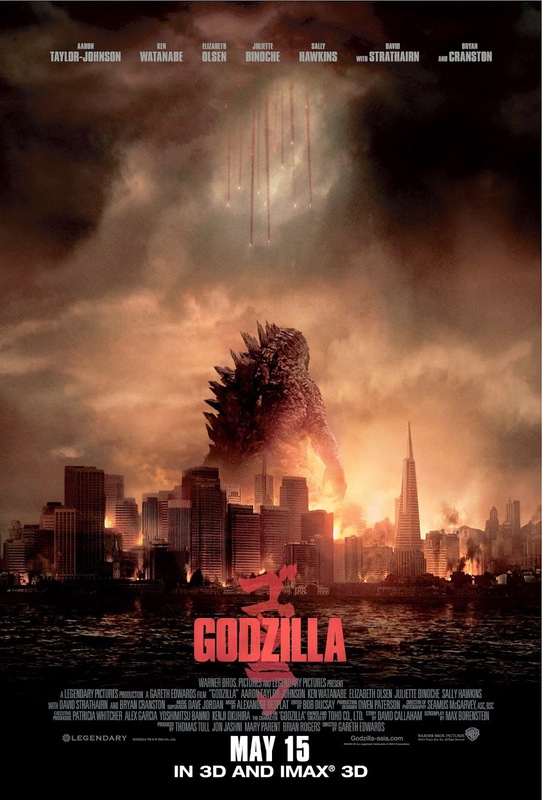 Many thought that it might’ve been an indirect sequel to the original 1954 film due to the already existing Godzilla in the past timeline in the story here while featuring a scientist by the family name of Serizawa, but it’s not a sequel of any sort at all, this is a complete reboot with some changes to the origins. There will be minor spoilers in this review so if you mind that, I suggest you skip straight to the summary below. This film is nothing like the 1998 adaptation (thank goodness), it’s not a disaster movie and the Godzilla here is not exactly hostile being, instead, it is an immediate nature’s “saviour of mankind”. Its existence, as believed by Dr. Ishiro Serizawa (played by Ken Watanabe) in the film, is to “restore balance” by defeating all other monsters that emerges. The humans misunderstood Godzilla in the past and tried to kill it during the war times, using nuclear tests as a cover up. In present time, Serizawa discovers some eggs in a Filipino mining with presumably its mother headed into the sea. These radioactive-absorbing monsters, named MUTO (Massive Unidentified Terrestrial Organism), can release EMP’s areal attacks that’d screw up or shut down all electricity. After an incident at the Janjira nuclear power plant (it’s somehow very near to a school) that killed Joe Brody’s wife along with many others, the city is quickly evacuated, labeled an exclusion quarantine zone and covered up by government. Years later, Joe discovers that not only it wasn’t an earthquake that caused the tragedy, the exclusion zone is actually free of radiation and that the monsters are communicating with one another. The character Dr. Serizawa seems to be there only to fill in the audience of what’s happening with a lot of stating-the-obvious dialogues, deliver philosophical lines and show the audience what kind of emotions we should be going through in each scene, and for all that, Ken Watanabe (Inception, The Last Samurai) did enough. Bryan Cranston (Breaking Bad) plays the grumpy and always-yelling Joe Brody, a power plant engineer who doesn’t live for too long in the movie. The film focuses largely on Joe’s son Ford, who’s an explosive disposal technician in the army. He’s played by Aaron Taylor-Johnson (Kickass, Kickass 2, Nowhere Boy), who gave quite an uninspiring, wooden effort for the character. The gorgeous Elizabeth Olsen (Oldboy) didn’t perform that well either but to be fair, her role’s just a typical teary young mother character who’s afraid but tries to stay tough for the son. Perhaps the cheesy performance of the cast is the result of Max Borenstein’s awful script. There’s just too much dull and humourless human drama, with “separated family” and US army involvement cliches, and dialogues that are almost as cheesy as Pacific Rim‘s. On my count, it takes about an hour and a half before the film finally gives us what we really want to see. And that first three quarters of the movie mounts up to almost nothing as I didn’t feel emotionally attached to the characters at all, and all that buildup does not drive intensity and fear as effectively as how War of the Worlds (2005 remake) and Cloverfield do. The strange human behaviour and reactions probably contributed to the downsides as well. The people in the movie run for their lives as soon as they see a tsunami coming, but when monsters appear, most of them just stand around and look, as though they don’t feel it’s as life-threatening as tsunamis. There are also plenty of annoying scenes, and some of them seem completely pointless. For example, when Joe sneaks into the exclusion zone with Ford, they don’t bother to hide away from the guards. When the army delivering the nuclear bomb calls the other side of the train track to check if the area is secured, it is obvious that they’re screaming and firing at the monster, and yet this bunch has to ask for a couple of times more, and in the end, still go on ahead. Then there’s a scene where a Japanese kid on a train who also gets separated from his parents, so Ford takes up the responsibility to take care of him while all the monster business is happening. What’s the symbolism of this scene anyway? A propaganda to show that American soldiers are nice guys? Now despite all that being said, this Godzilla reboot is a major improvement from all previous films of the franchise. Well, visually at the very least. The cinematography, choreography and CGI are fantastic. However, there has been complaints by the Japanese fans saying that this version of the titular monster is too fat and “needs to go on a treadmill”. Well it’s definitely buffer than the ones in the classics, more muscular with seemingly bigger and longer arms. It also has a more human-like face with expressions, something that Godzillas in the past never had, I believe. It can charge and fire its trademark blue radioactive heat ray/flames out of its mouth. Its opponents, the MUTO’s, look like robots due to its metal-like skin and squarish shape. It has hooks as arms and wings to fly, which Godzilla would struggle with during their fights. The structure of the MUTO’s body sort of resemble the Cloverfield monster’s. They’re not Mothra although the plot does remind me of Mothra vs. Godzilla (1964). As opposed to the Japanese films, the significant scenes with the monsters in action are mostly at night in the dark, but just like in Pacific Rim, the full body of the monsters are shown when they’re fighting. Although the fight between the monsters at the end are extremely fun and exciting to watch, there’s just not enough of it. It’s far from satisfying and it lacks of a genuine wow factor. Ultimately, we don’t need 90 minutes of buildup and boring cliched human stories (that could’ve been easily shortened), we just need more of Godzilla and the monsters being mad destructive, with more buildings getting wrecked up and destroyed! Censorship in Malaysia: Nothing seemed to be cut at all for the press preview held at TGV 1 Utama yesterday. To watch in 3D? Highly unnecessary. I’ve seen in it in its full IMAX 3D glory and even then the visuals were like in 2D only, presumably ’cause it wasn’t filmed in 3D. The audio, however, was mixed in Dolby Atmos surround-sound format so I do believe the viewing (or rather hearing) experience would be better if the audience get to watch the film at a Dolby Atmos cinema hall (there’s one at GSC 1 Utama now). Verdict: It would’ve been great if we could just fast forward most parts of the first 90 minutes to the last 30 minutes of the film to just watch the battle between the King of Monsters and other monsters. I probably wouldn’t have expected so much more if this film was released before the cooler and more action-packed Pacific Rim.